Today we continue with the story of George Gordon Macfarlane in volunteer Lewis Swallow’s second post. Macfarlane’s biography on the Dictionary of Scottish Architects showed that he continued as an architect after returning to London at the end of the war. Here, he ran his own practice where he designed inns for the brewers Watney Combe & Reid. In 1930, Macfarlane was granted Fellowship to the Royal Institute of British Architects, a title he was put up for by Thomas Smith Tait, who was also a former student of Professor Bourdon’s at the GSA and who worked for John James Burnet while Macfarlane was there. Tait, who went into partnership with Burnet, designed Glasgow’s 1938 Empire Exhibition. During the Second World War, Macfarlane was employed by the War Damage Commission but his deteriorating eyesight made his work increasingly difficult. Macfarlane’s sister was the author Catherine Roxburgh Carswell who gained literary recognition for her controversial biography of Robert Burns and for her novels which were set in the West End of Glasgow. Carswell had a lengthy affair with the painter and GSA professor Maurice Greiffenhagen. She was dismissed as a critic for the Glasgow Herald after giving D. H. Lawrence’s novel The Rainbow, which was banned in Britain, a positive review. Carswell became close friends with Lawrence and wrote his biography The Savage Pilgrimage in 1932. Lawrence, in a letter to Carswell, praised The Natural Man, the first novel written by her brother, as “extremely good of war: the best I’ve read”. Published in 1924, the book was also favourably reviewed by fellow ex-servicemen J. B. Priestley and Edgell Rickword, who said it was “a very fine study of the fighting man” and was near to “the whole truth of war psychology”. After an illness in 1929, Macfarlane seemed to focus more attention towards his writing. 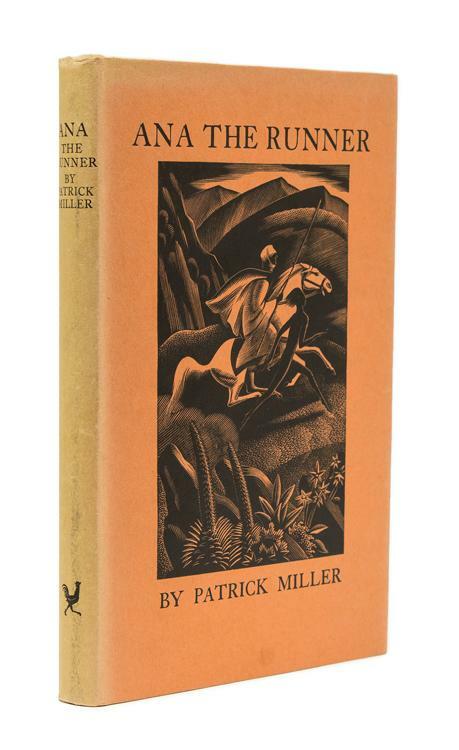 He wrote under the pseudonym of Patrick Miller (the inventor and banker Patrick Miller of Dalswinton was an ancestor of Macfarlane’s mother). His subsequent novels were: The Deep End (1927), The Magic Circle (1933), The Green Ship (1936), and Ana the Runner (1937). For his last literary work, Woman in Detail (1947), Macfarlane used his architectural expertise to “describe woman in a new way”. The latter three books were published and printed by Golden Cockerel Press, a company recognised for its beautifully handmade and illustrated limited editions. The Green Ship was illustrated by Macfarlane’s friend, Eric Gill, and Ana the Runner was illustrated by Clifford Webb. Macfarlane married Anne (Nannie) Niemeyer in 1922 and they had one child, Anne Gordon, who was born in Hampstead in June 1925. Nannie died suddenly in her sleep in 1942. Anne Gordon served in the Woman’s Royal Navy Service (Wrens) before her death in December 1945 from injuries sustained in an accident on the underground railway. As well as an architect and author, Macfarlane was also a keen traveller. Having “apparently visited most parts of the world”, he was described by his publisher as “a globe-trotter by way of relaxation”. A regular visitor to Italy, where he had family, Macfarlane died while on the island of Capri in January 1949 after a brief illness. George Gordon Macfarlane’s story encapsulated the range of fascinating lives the students of the GSA led before and, if fortunate, after the war. The research I did for the project particularly highlighted to me the level of disruption the war had on peoples’ lives and plans, socially, professionally and academically. English Fiction and Drama of the Great War, 1918–39 by John Onions and Paula Losocco. The Letters of D. H. Lawrence, by James T. Boulton et al. Fighting Different Wars: Experience, Memory, and the First World War in Britain by Janet S. K. Watson. Catherine Carswell: a biography by Jan Pilditch. Cockalorum: a bibliography of the Golden Cockerel Press 1943-1948 by Christopher Sandford.